Rededicated in September 2014, after a major renovation, the refurbished hall includes an 8-foot stage extension, energy efficient LED lighting, a new projection screen, 644 seats, an improved sound system, and beautiful new hardwood interior, among other improvements. 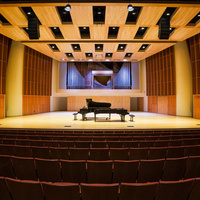 It accommodates large ensembles, guest artists, and senior recitals. Located within the James J. Whalen Center for Music. The best choral concert I have ever seen. Masterful musicians presenting a creative and broader range of pieces to perform. Having a string quartet perform jazz of Dizzy Gillespie I imagine is a once in a life time opportunity! A beautiful and uplifting concert! The group has impeccable intonation and musicality, and their ability to sing as one voice is truly remarkable. VOCES8 has a fantastic presence on stage, with enchanting, tight harmonies and inspired to keep people singing. loved attending. Hope they come to visit again soon! What a beautiful evening together. Thank you to the brilliant and inspiring Dr. Nia, and to Professors Whitehead and Galván for organizing this motivating and affirming community experience! This was the first time I attended such an event at IC, I am sure it will not be the last one. Both the Orchestra and the audience were wonderful and I enjoyed my time.